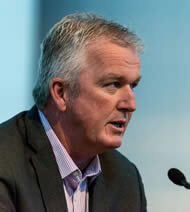 The mood at last week’s Single-Engine Turboprop Operations Conference showed the promise of this sector in two areas - its ability to broaden the customer base in business aviation and to relieve the beleaguered airline traveller as a catalyst for new short haul regular services for abandoned communities. Subscription airlines services such as Wheels Up and Surf Air, both having made a success in the US, are moving to start up operations in Europe. Surf Air Europe is already operational on routes from Luton to Cannes, Ibiza and Zurich and CEO Simon Talling-Smith pledged he would bring PC-12s over here within six months while adding the Phenom 300 to Surf Air’s US fleet. 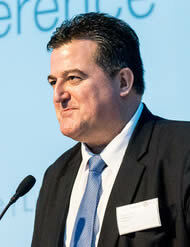 Managing Director of New Zealand’s Sounds Air Andrew Crawford, told the nearly 150 assembled delegates that running a single-engine-turboprop airline ‘works’ and it works safely, providing a necessary connection to the rest of the world - from one of the remotest regions on earth. Sounds Air packs 12 passengers into a Cessna Caravan in an airline style operation. They have been operating for 30 years (flying Caravans and most recently Pilatus PC-12s). His PC-12s and Cessna Caravans ferry 125,000 passengers around New Zealand and he expects to grow both his fleet and operations to fly 200,000 by 2020. He also acknowledged that the company is now on the radar of Air New Zealand and has started taking over abandoned Q300 routes. One of the most important issues raised during the conference was the British Government’s plans to close many general aviation airfields in favour of affordable housing. 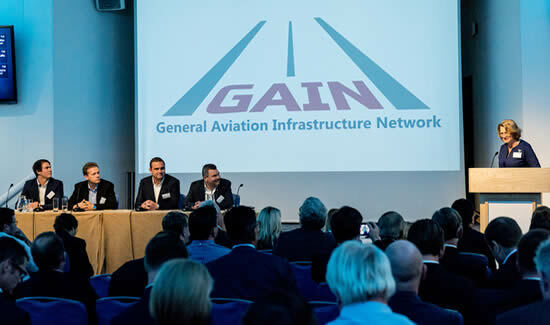 General Aviation Infrastructure Network (GAIN) Managing Director Pauline Varney discussed the crisis facing British aircraft operators and airports as part of a session which included No to Fairoaks New Town (Fairoaks 2020 - is the better name) Chair Doug Mancini reported that the 35,000 signatures raised in support of the airport had been tossed out by the local council. Those 35,000 signatures, however, represented constituents who understand the airport’s vital economic role in the community. With three Pilatus PC-12s amongst the 50+ aircraft on the field and Gama Aviation’s helicopter and King Air maintenance facility, the jobs and contributions to the local economy are easily in the millions of pounds. This is in addition to its strategic role in maintaining Britain’s security and make it, like many airports across the country a vital part of the global transportation system. 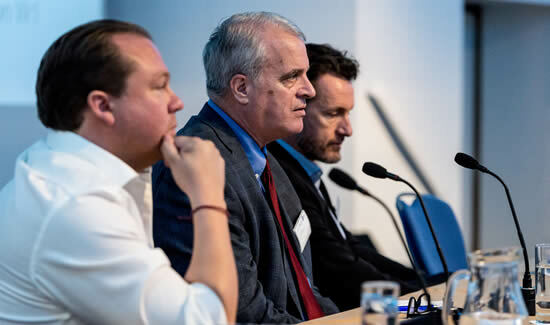 Pauline Varney's panel comprised Emeric de Waziers, Co-Founder, Wingly; Ian Sheppard, International Editor, AIN; Dave Ford, GM, Goodwood Aerodrome and Douglas Mancini, No to Fairoaks Newtown. SETOps 2017 drew financiers, aircraft and engine manufacturers including Pratt & Whitney Canada, Piper, Daher, Pilatus/Oriens its UK distributor and Textron, which already produces one of the most popular aircraft in use today, and are entering the market with the clean sheet Cessna Denali which joins the mounting number of single-engine-turboprop fleet in the next few years. Newcomer Waves CEO Nick Magliochetti who flew in to London Oxford Airport having just secured their Guernsey 2-reg AOC just one week before briefed the packed lecture theatre at the Royal Aeronautical Society in London, on the work involved in becoming the first SETs operator in the UK connecting Guernsey and other areas to the mainland, providing an important alternative to traditional transportation. Magliochetti said he knew the instant he moved to Guernsey the area needed the type of service he has since developed. In an interesting point-counterpoint with representatives of the financial community, he identified another void in the market beyond air service. Speaking on a lively finance panel, led by Brendan Lodge, he indicated traditional banking was no help in providing the financing for his start up and, thus, what was needed was the type of venture capital available to the tech community from which he comes. He sits on the board of Microsoft and in this company’s efforts to foster start-ups and new technology, he highlighted there was a need to create a similar capital pool for the new transportation models developed to disrupt how people get from Point A to Point B. What seemed most interesting was the fact that, unlike most aviation conferences - especially those scheduled on a Friday - the entire audience not only stayed to listen to late afternoon speakers but were still networking well into the evening reception where organisers Emerald Media and BlueSky News thanked everyone with drinks on the terrace. Comments during the reception ranged from how much they had actually learned about this new segment of the air transportation industry to the fact this was one of the best aviation conferences one participant had attended in a very long time. Clearly, the interest in single-engine turboprop passenger operations after EASA approved such operations on 1 March is growing. Not only are operators creating a new industry but airframe and engine manufacturers are listening. So, if you have any interest in this segment we should see you at SETOps 2018!